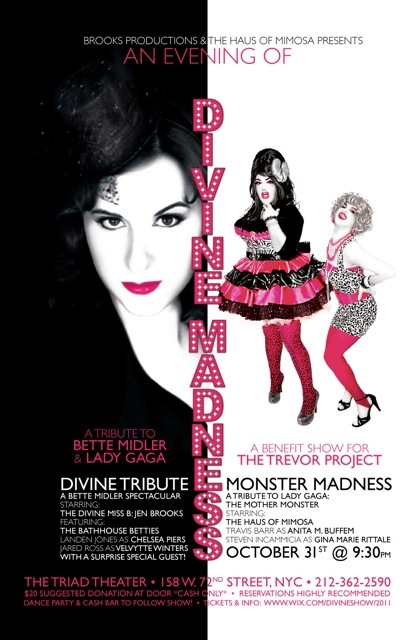 Astoria's award-winning comedy and singing collaborative, Sunday Morning Mimosa, will be performing three very special performances over the Halloween weekend in an effort to raise money for The Trevor Project, the leading national organization providing crisis intervention and suicide prevention services to lesbian, gay, bisexual, transgender, and questioning youth. $20.00 gets you open bar for 2 hours and the chance to win Katy Perry concert tickets, an iPad2, or an iPod! PROCEEDS BENEFIT THE TREVOR PROJECT. Additional Raffle tickets are $1 and will be sold all weekend... prizes will be drawn November 3rd. Tickets benefit the Trevor Project ($25 at the door/$20 in advance) plus guests receive a swag bag and an open bar from 9-10PM. DJ Juicy Fruit will spin dance tunes throughout the evening. Sunday Morning Mimosa will preview some of their special numbers from the GaGa tribute premiering in their upcoming show at the Triad Theater. Guest performances by the ridiculously talented Brianna Davis (karaoke hostess at Mix), Melissa Driscoll (USO performer famous for her shows at the Stonewall Inn), and Jen Brooks (singer and Bette Midler impersonator).